A few days ago we noted that Pensar, an MSPmentor 100 company in Europe, has built a successful managed services practice that includes a major focus on Apple (AAPL) customers. A few days ago we noted that Pensar, an MSPmentor 100 company in Europe, has built a successful managed services practice that includes a major focus on Apple (AAPL) customers. The next natural move, we speculated, involves Pensar focusing on more mobile device management (MDM) and mobile applications management (MAM) opportunities. Pensar’s response? Absolutely yes. Mark Williams, managing director of Pensar, points to several potential paths forward. In an email to MSPmentor, Williams indicated that Apple Push Notification is an obvious place to start, and a useful new tool is Apple Configurator (MSPmentor agrees). For cross-platform MDM, especially in mid-market and enterprise environments, Pensar sounds like it highly respects AirWatch. But the company is also looking at MaaS 360 and Good solutions. Another piece of advice from Pensar to the MSP crowd: Don’t overlook the BlackBerry installed base as you develop your MDM strategies. Pensar has, for many years, used BES to look after the company’s BlackBerry clients. Williams and I did not discuss MDM or MAM pricing strategies during our email exchange. That’s a prime conversation for another day. 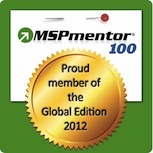 Note: We regularly profile MSPmentor 100 companies — the world’s top managed services providers — to gain business updates, insights and tips for peer MSPs. Got an update to share? Email Contributing Managing Editor Jessica Davis (jessica [at] NineLivesMediaInc [dot] com) and she’ll route your note to the most appropriate MSPmentor blogger. I advise my MSP Coaching clients each day that Apple support and knowledge (combined with other critical focuses) will provide them with a competitive advantage. Yes, I a once proud Microsoft flag waver is almost 100% Apple. The only exception is my Windows Phone that I use in the US and love. Kudos to Mark and the team of Pensar, they are one of the top IT firms in the UK and this just proves this once again. Thanks for the kind comments Stuart. I’ve seen Pensar, led by Mark, go from strength to strength based on their ability to give clients what they want – the Apple work being a case in point. Yet many other MSP’s still shy away from this strategy. Why? I think it comes down to comfort levels. It’s difficult to move away from what you know to something new. More credit to Pensar and Mark for showing the rewards that await those who make the move. Kudos to Mark and his team. They’ve been savvy at identifying trends and opportunities and taking advantage of them. During my time facilitating HTG11 in the UK, I watched Mark’s organization grow and thrive. Great work guys — keep it up!